The macabre, yet merry world of Edward Gorey has provided the backdrop for MYSTERY! since the series began in 1980. Both the opening credits and stage sets for the series are based on his work, as adapted by animator Derek Lamb. Gorey's weird, yet genteel sensibility -- even ghouls should be properly attired, after all -- is a perfect fit for the series and WGBH has been pleased to share his art with our audience. Gorey died of a heart attack April 15, 2000, at his home in Cape Cod at age 75. The following interview with the artist was conducted by Ron Miller in 1996. Swooning heroines in long gowns, sinister men in bowler hats and handlebar mustaches, dark figures playing croquet in a rainstorm -- these are some of the unforgettable cartoon images that open and close each week's episode of MYSTERY! And they're all mysterious escapees from the whimsically wicked world of Edward Gorey. From the very first episode, Gorey's incredibly imaginative imagery, animated by Derek Lamb, has given the series is signature look. His skulking characters may seem to be up to no good, but look more closely and you'll probably realize Gorey is winking at you, like that skull in the tombstone in the opening credits. The message well may be: Enjoy what follows, but take it seriously at your peril. One of America's most eclectic -- and eccentric -- creative artists, Gorey was a writer who illustrated his ideas in a variety of mediums and wasn't necessarily particular as to what form they took. Starting in the early 1950s, he published more than 70 books of drawings such as The Beastly Baby and The Curious Sofa which brought his often macabre literary ideas to life. His illustrated versions of other people's work, including T.S. Eliot's Old Possum's Book of Practical Cats, are perennial bestsellers. A major retrospective of his work, The World of Edward Gorey, by Clifford Ross and Karen Wilkin, was published in 1996. His 1978 set designs for the Broadway revival of Dracula set him off as a stage designer, and his costumes for that show earned him a Tony award. His rare excursions into animation, including the short series of "Fantods" he did for MYSTERY!, have added to his enormous cult reputation. When he was in his late sixties, Gorey produced, wrote, directed, and occasionally even acted in his own community theater productions in the Cape Cod area, where he lived and worked in his later years. 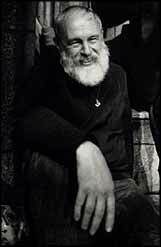 Born in 1925, Edward St. John Gorey was the only child of Helen and Edward Lee Gorey, a Hearst newspaperman based in Chicago. A precocious reader -- Gorey said he devoured Bram Stoker's Dracula at the age of five "and I was scared to death" -- he also began to teach himself how to draw. He later attended a few courses at the Art Institute of Chicago, but that's all the formal training in art he ever received. He graduated from high school in 1942 and was immediately taken into the Army, spending much of World War II as a clerk at the Dugway Proving Ground in Utah, mysterious site of the U.S. government's experiments in poison gas and bacteriological warfare. After the war, he majored in French literature and earned his B.A. degree in 1950. Though Gorey worked in mainstream publishing for a time (he was in Doubleday's art department for eight years), his real passion was creating his own bizarre stories and illustrating them. His ideas were often misinterpreted as "ghoulish," and he was turned down by publisher after publisher until The Unstrung Harp came out in 1953 and his reputation began to grow. Because many of his drawings were of children, he often was mistaken for an illustrator of children's books. Yet many publishers considered his books unsuitable for children because of what happens to some of the young characters. ("A is for Amy, who fell down the stairs," comes from one of his so-called "alphabet books.") Still, his darkly comic vision began to build a legion of fans of all ages and, in 1959, the great literary critic Edmund Wilson, writing in The New Yorker, hailed Gorey's work as "poetic and poisoned," and compared him to both Max Ernest and Ronald Searle. Gorey's work seems to invite psychoanalysis for some. Critics have searched for deep meaning in his often obsessive crosshatching in the backgrounds of his drawings, in his subject matter, which often seems firmly preoccupied with death, or in his uneasy relationship with his doting mother as keys to understanding his art. Gorey neither helped nor hindered such inquiries; he mainly seemed bemused by them. His unusual lifestyle only fueled the concoction of more psychological theories. Tall and lean, Gorey was bearded, but otherwise gloriously bald. He wore earrings and used to go about in long fur coats before his conscience got the better of him and he earned the blessing of animal rights activists by shedding his furs permanently. Gorey never married and admitted to no romantic relationships. He lived by himself in a rambling home in Yarmouth on Cape Cod, that dated back nearly 200 years. When he was not working on the 100 or so projects he had outlined for himself at any given time, he cared for his brood of six cats or indulged himself in one of his many special interests, mostly sedentary pursuits like watching old movies he taped off his satellite dish or zoning out on his favorite television shows, such as The X-Files. Though Gorey has was called a recluse, he really did not behave like one. For nearly 30 years, he attended every performance of the New York City Ballet until the death of his artistic idol, choreographer George Balanchine. He ate both breakfast and lunch each day at Jack's Out Back restaurant in Yarmouthport, where he happily signed autographs for the occasional fan. Often mistakenly labeled as "morbid," Gorey is was in fact a rather cheerful individual, whose sharply pungent observations were laced with a ready wit. He was a superbly entertaining conversationalist who frequently enlivened a chat by humorously slipping into a falsetto voice or punctuating his remarks with a "turkey gobble" sound that one isn't likely to hear ever again. Gorey's long association with MYSTERY! began in 1979 when he was still riding the enormous wave of national publicity coming from Broadway's Dracula, and he was sought to do the series' opening credits. Did you take a very active role in the wedding of your art to the world of MYSTERY!? When we first started talking about it, I gave them a scenario for the credits, but they said, " Thank you, very much, dear, but this will take half an hour." I told them it wouldn't if they put it on at a reasonable rate of speed, but they didn't seem to care for that idea very much. So [animator] Derek Lamb or somebody concocted the final scenario and I had very little to do with it. Originally, I was going to draw all the backgrounds and every time I'd sit down to do them, someone would call at the last minute and say, "We've changed our minds. We're going to do something else." Ultimately, Derek Lamb was responsible for the whole thing. What about your influence on the sets for MYSTERY!, which host Vincent Price used to call Gorey Manor? This isn't terribly flattering to anybody, I'm afraid. I went up to Boston a couple times, distributed bric-a-brac around, made suggestions and whatnot. Joan Wilson and I went around picking up things at flea markets and antique stores. Then they decided to abandon the three-dimensional set and go with flat drawings. So, I did a bunch of flat drawings, thinking the whole thing would be black and white and fairly austere. They kept calling me up and asking if I could do four more yards of wallpaper. Then I saw what they'd done with the first one or two. Well, I didn't throw a fit in public or anything, but I finally said I didn't think this was working out -- and they've been faking me ever since. At one point, though, MYSTERY! developed some short animated Gorey stories they called "Fantods" to use as fillers at the end of the shows, beginning in the third season. They were widely praised. What did you think of them? I was very pleased with those. Joan thought that up. I had a great deal of fun making those. I went up for a couple of days to help. They had two men and two women to read the parts. Which MYSTERY! series seems to fit most neatly into the world of Edward Gorey? Any of the period ones do to some extent. I suppose the Agatha Christie stuff they've done is vaguely like some of my period drawings. I very much like the Tommy and Tuppence ones, the Partners in Crime. I quite admire Joan Hickson, but she's just a little too dark for Miss Marple. I'm old enough to love Margaret Rutherford's Miss Marple, even though I know perfectly well she wasn't Christie's idea of Miss Marple. When did you first notice your trademark style of drawing emerging as your metier? Probably when I was 20 or 21. I was just drawing and writing without any particular [focus]. When I finally was published, I was 28. I don' t know if that pushed me in any particular direction. I don' t think I had any ambition to do anything much. It was just what I did. But I pretty much stuck with it once it jelled. I would hesitate to say it was anything as strong as a metier. What's the biggest myth about your work? That it's gothic. Years and years ago, somebody wrote a very nice piece about me and referred to me as "American gothic." It sort of stuck. Does it bother you when people lump you together with people who do "horror" like Stephen King or Charles Addams? Yes. Only very occasionally do I try to shock in a mild sort of way. I'm very squeamish really. As for Charles Addams, I knew him. We had the same agent. I occasionally would have lunch with him. I was told he envied me because I had a more highbrow reputation than he did. I love Charles Addams' stuff. I suppose there's always the possibility somebody will come along and want to do the equivalent of The Addams Family movie with my stuff. Well, I'm not that rich, so I'd probably say, "Go ahead." How did you get involved with the Broadway version of Dracula? A very good friend of mine produced it and brought it back, and in that sense he was very smart, but I thought the whole Dracula thing was perfect nonsense. Since I was in on it from its inception, I think I can say with authority that I don't think anybody knew what they were doing. It started out on a stage that was on one of those raised platforms in a grammar school gymnasium in Nantucket. For some reason, it caught on down there. Artistically, it was a hodgepodge to end all hodgepodges. I knew nothing about set design. It was just one of those flukes that worked quite well. Of course, it made me a lot of money. It made everybody a lot of money. For some extraordinary reason, I was given a piece of the show. You seemed a little surprised to get a Tony award for designing the costumes. That was one of the more preposterous things. I did all of eight costumes and they were zilch but everybody loved the sets. There was somebody else who deserved the set design award much more than I did that year, so they didn't feel like they could give that one to me. They gave me the costume award instead. Dracula wasn't just a passing flirtation with the theater for you. Hasn't it become a real passion for you lately? I had another show that was an off-Broadway success [Amphigorey, The Musicale], but was one of the legendary Broadway turkeys that lasted one performance. In the last 10 years, I've done a lot of very local theater. I write, I direct, I design, I do everything. I even act if something happens to somebody in the cast. A lot of the actors I use are people who look like I might have drawn them. I even choose the music. That's really what I enjoy. People sometimes say it's such a pity this isn't going somewhere else and I say, "Well, where would it go?" You're such a big movie fan, why haven't you made your own movie? I have a silent movie script I wrote years and years ago for a budget of $50,000. I keep hoping somebody will call me up from Hollywood and say, "We just came across this, would you like to make it?" If somebody came to me and said, "We'll give you carte blanche to do a movie," I'd be thrilled. I have enough egotism to think I'd get through to the cameraman by osmosis. Who are the typical Edward Gorey fans? It ranges from dear little old ladies to rather distracted teenagers who sometimes turn up at the door. I go to the same place for breakfast and lunch every day. Most of the people there are regulars, but every once in a while somebody will come up to the table and say, "I have a book of mine in the car. Will you sign it, please?" And I'm thinking, "What is a book of mine doing in your car?" I'm nothing if not terribly amiable, though. You already have more than 75 published books. What are your priorities for work these days? Whatever has popped into my head. I also rely on serendipity a good deal. That's the trouble. It's gotten worse and worse. I have to write before I draw, so I now have about a hundred manuscripts that have to be illustrated. Well, obviously I'm not going to live long enough to do more than a few of them. I simply rely on my dear little unconscious to produce new ideas. I remember when I was much younger and had only published a couple of books. I thought, "Oh, dear, what if I never get another idea in my life?" But I've never had writer's block for more than two minutes. Now I have notebook after notebook filled with this, that, and the other thing -- bits of plays, bits of books, drawings for nothing in particular. It's just mounting up. Your work is often concerned with death. What's your own attitude toward death? I hope it comes painlessly and quickly. I had a heart attack I didn't know I had until the doctor told me. That same week I discovered I had prostate cancer and diabetes, which was pretty much a downer. I figured I was going to be dead in a week, so I began to think about it a lot. But then the diabetes turned out to be very controllable and I get a shot in the fanny for the prostate cancer once a month, so I've had it for about two years. I'm good about taking my medicine and I eat fairly properly. I may not live forever, but I feel perfectly fine all the time. When you look back at your career, are you content with what you've achieved? There's some demand for my work, but it isn't exactly staggering. I have kind of an ardent little following, but the accent is on little. I know what it's like to be a very, very minor celebrity. My name turns up in a review of a book or something where they say it's very "Edward Goreyish" or something like that. That happens often enough, so I feel I've made a tiny mark somewhere. Reprinted with permission from MYSTERY! A Celebration, Ron Miller, 1996. Trouble reading this page? Click here.